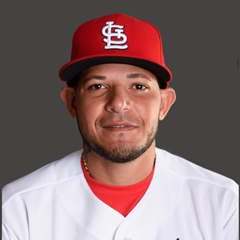 The online Puerto Rican publication Primerhora.com reports that St. Louis Cardinals catcher Yadier Molina has been named by the Puerto Rico Baseball Federation to head its U23 National Team. The team will play in the premundial category tournament from November 23 to December 3 in Panama. Molina will be supported by World Cup coaches Jose Cruz, Jose Molina, and Victor Ramos. A list of players has not yet been published, but the roster will have 22 players, 75% of whom will be active major and minor leaguers. The remainder will be amateurs. Molina will be in charge of selecting the players and obtaining the necessary permits from the players’ current organizations. He will also pay for the trip and the accommodations for each player. Molina has arranged for the team to train at the Cardinals’ Spring Training facility in Jupiter, Florida. Update: Among the players participating is Cardinals shortstop prospect Delvin Perez. Peter Gammons of Gammons Daily reported that the Cardinals have made “one of their best young pitchers” available for a possible trade for Marlins’ outfielder Giancarlo Stanton. Stanton’s remaining contract with the Marlins is sizeable, and Gammons stated that the Cardinals would expect the Marlins ownership to retain the payment of some of the money owed Stanton if the Cardinals were to trade a top prospect. Derrick Goold of the Post-Dispatch reports that the Cardinals are looking at the free agent market for a closer and the club has reached out to agents of several free agent relievers as yet unnamed. Free agent relievers available include Greg Holland, Anthony Swarzak, Bryan Shaw, and Juan Nicasio. Nicasio, who was acquired by the Cardinals in September from the Philadelphia Phillies, is now a free agent. Also available are Wade Davis and Brandon Kintzler, already established closers. 11/2: Pitchers Juan Nicasio, Seung-Hwan-Oh, Lance Lynn, and Zach Duke all elected free agency. On November 2, all pending free agents became eligible to elect free agency. Four Cardinals pitchers have elected free agency. They are Juan Nicacio, Lance Lynn, Seung-Hwan Oh, and Zach Duke. A quiet period, where teams can enter into discussions with their pending free agents about extensions, ends at 4 pm CST on Monday, November 6. Other teams are prohibited during this period from negotiating with or entering into contracts with another team’s free agents. During this quiet period, teams may make their free agents a qualifying offer, which is valued at about $17.4 million dollars for a one-year contract. Free agents have ten days following the conclusion of the quiet period to accept or reject the qualifying offer. It has been reported that the Cardinals are unlikely to make a qualifying offer to any of the four free agent pitchers, though the possibility remains for Lynn. November 20 is the deadline for teams to finalize their 40-man rosters for the upcoming Rule 5 Draft on December 14. Look for movement to and from the Cardinals roster between now and November 20. That movement could include trades, as well as outrighting or releasing of existing 40-man players. Also coming up in November are the GM Meetings, scheduled for November 13-16 in Orlando Florida. In past history segments, the author has written articles based on current events occurring during the week. Now that the baseball season has concluded, this and future history segments during the offseason will often be based on past Cardinals’ teams chosen at random. The segment this week has a connection to me. I recently celebrated a birthday, and thus have chosen the year of my birth, 1959, as the focus this week. The 1959 St. Louis Cardinals played in the 78th season of the Cardinals’ franchise. The team finished the season with a record of 71-83, which put them seventh in the National League (there were no divisions in 1959). The National League pennant and World Series winner that year was the Los Angeles Dodgers; the Cardinals finished 16 games back. 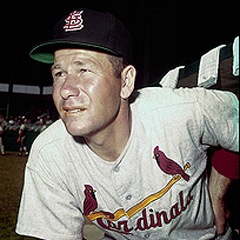 The manager of the 1959 Cardinals was Solly Hemus. Hemus began as player-manager, but was released as a player in mid-June of that year. The General Manager was Bing Devine and the team was owned by August (Gussie) Busch Jr. Among the players from that team who should be familiar to Cardinals’ fans are infielder Stan Musial, pitcher Bob Gibson, and catcher Tim McCarver. It was McCarver’s rookie year; he did not make his MLB debut until September 10 at the age of 17 (and he turned 18 a month later). Other familiar names are Ernie Broglio (who was later traded to the Cubs for Lou Brock), Ken Boyer, and Curt Flood. The Opening Day starter in 1959 was Larry Jackson. The top MVP vote getter on the team was third baseman Ken Boyer, who placed 10th in the voting. Boyer led the team in home runs with 28, and RBI with 94. Jackson finished the season with a record of 14-13 and an ERA of 3.30 over his 256 innings. Notable games in the 1959 season included a pair of 11-1 blowouts of the Chicago Cubs and the Pittsburgh Pirates, on May 9 and May 20, respectively. The worst losses were a 11-0 defeat at the hands of the Philadelphia Phillies on July 9, and a 18-2 drubbing by the Pirates on August 6. The longest losing streak in that season was seven games from August 18 through August 25. The team had four four-game winning streaks in that season. Boyer won a Gold Glove, one of his five Gold Gloves in all, four of which were consecutive, from 1958 through 1961.